Biography and fiction seem entirely different genres because in biography one wants to know certain facts of what actually happened, whereas fiction is a world of possibility. But these genres seem to be twins, or at least siblings. Both are about selves in the social world and, for both, the centre is the idea of character. On writing biography, Leon Edel (1957)—famous as the biographer of Henry James—put it like this: the biographer "must perform the unusual … act of incorporating into himself the experience of another, or shall we say, becoming for a while that other person" (p. 7). This seems close to what one does as a novelist in depicting a fictional character. I have just finished reading Hermione Lee's (2009) engaging introduction to biography in which she gives us a whole sweep of what it is to write a Life, from the doings of Gilgamesh to the repeated attempts to write the being of Marilyn Monroe. In Lee's book and in Edel's we read of the influence of psychoanalysis, which is not only the quest to enable each of us to achieve a conscious realization of our own biography, but which has had an enormous influence on the writing of biography. No biography is now complete without some view of the subject's early life and traumas, or without some commentary on his or her later sexual relationships. In his book, Edel has a chapter on the importance of psychoanalysis in biography, in terms of what he calls the "symbol life" of the subject. In this chapter he writes an uncommonly interesting analysis of The professor's house by Willa Cather, and some biographical thoughts about her writing of it. The novel's protagonist is a professor who, despite considerable success, becomes depressed. He wants only to regress in his sequestered study—symbolic of the womb. Edel proposes that the theme of a place of one's own where one feels a lonely comfort was prompted by Cather's own displacements from home, her failures to write in various houses and studies that were offered her and, despite her considerable success, by her own painful feelings of rejection and insecurity. Recently, there has been an entirely new contribution that promises to be as influential as symbol-based approaches. It also derives from psychoanalysis (as well as ethology) in the work of John Bowlby: the development and maintenance of attachment relationships. The first book based on this work to accomplish psychological biography successfully is by Carol Magai and Jeannette Haviland-Jones, (2002). It is called The hidden genius of emotion. In it, the authors depict the character of three men, each the inventor of an influential school of psychotherapy. One is Carl Rogers, founder of the counselling approach to psychotherapy. The second is Albert Ellis, founder of rational-emotive therapy, one of the tributaries of cognitive behavioral therapy. The third is Fritz Perls, founder of Gestalt therapy, a dramatized version of psychoanalysis. The core idea of Magai and Haviland-Jones’s book is of preoccupying emotional themes, which grow out of each individual's attachment relationship with parents or other caregivers. In our relationships, and in our lives more generally, one set of emotions becomes predominant, and forms an emotional style of character which, because of its one-sidedness (which we all have), sets a pattern, which affects how others relate to us, and which tends to be expressed in distinctive patterns of behaviour. Because, almost inevitably, one has restricted one’s emotional repertoire in one’s first close relationships, one has to deal with implications of that restriction, which tend to lead into particular avenues of adult relationship and preoccupation. Attachment has become perhaps the strongest idea in psychological research on child development, but it has yet to be fully employed in analyses of character either by biographers or novelists. John Bowlby (1969). Attachment and loss, Volume 1. Attachment. London: Hogarth Press (reprinted by Penguin, 1978). Leon Edel (1957). Literary biography, the Alexander Lectures 1955-56. Toronto: University of Toronto Press. Hermione Lee (2009). Biography: A very short introduction. Oxford: Oxford University Press. Carol Magai & Jeannette Haviland-Jones (2002). The hidden genius of emotion: Lifespan transformations of personality. New York: Cambridge University Press. I think Emma O' Donoghue's Man Booker short-listed "Room" tackles the theme of attachment in a profound and sensitive way. Thank you very much, Mark, for this comment. I get the impression that a lot of biographers like the idea of a life being completed by death, in the Aristotelian way you mention. I think that in fiction death can be very problematic, perhaps because fiction strives to offer contexts in which readers can make life meaningful and so the often-meaningless fact of a death can be hard to come to terms with. The romantic idea of a couple in love dying together can be made meaningful: for instance Romeo and Juliet are united in death in the way they could not be in life and this is among the literary possibilities you point to. I think the idea of loss of control of one's life is very thought-provoking, for fiction and for life: not fatalism but—as you say—the coming of the inability to act in the world ... and that can come in many forms. Thank you very much P.M. Doolan. I have been looking out for attachment-based novels, so your recommendation of Emma O'Donoghue's novel Room is very welcome. 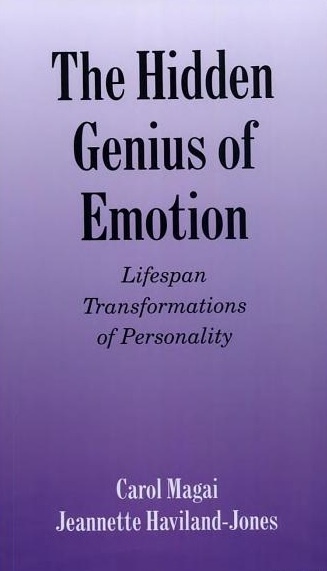 I've managed to get hold of "The Hidden Genius of Emotion." I've not found a book quite so troubling and simultaneously stimulating since I put down Briggs' book in the middle--and, regrettably, never got back to reading the second half...So, thanks for provoking me to get it. But, I have to add: their use of the term 'relativism' is, I think, confused. All they have a right to mean by it is "an ability to see particular psychological issues from differing emotional perspectives" (their words from p. 358 discussing Perl). But they outrun that meaning and go on wholly unnecessarily to endorsing extravagant post-modernist claims about truth and reality. For me, as a philosopher, it's a clear case where a psychologist could benefit from more philosophy. Thank you, Mark, for this comment. I am glad you found Magai and Haviland-Jones's book interesting and worthwhile. I have to say I didn't jump up in alarm at their idea of relativism (indeed I can't now even remember them discussing it) but I know, of course, what you mean. It's likely that, as psychologists, they don't carry the same weight of meaning in the term "relativism" as you do, and so they may appear confused. My take on their book is centred on their idea of a new kind of biographical writing. Now that I've finished the book, I can say the post-modern bit was really only a couple of pages, and, yes, I think I agree that "relativism" has a special meaning, so I over-reacted. Your own comments on the book helped me frame it, though I continue to find my thoughts about the project troubling and incomplete. I'll need to re-read the book and think more about it someday. However, what was most helpful of all was to discover that the sessions with Gloria are now on Youtube. Seeing Perls tell Gloria that she was "phony" I thought that this is so like the reaction of my students in Slovakia to American friendliness. Seeing Ellis in action increased my sympathy for him--as reading about his method it seemed to me to be a crystallization of American phoniness, and I found it distasteful in all the ways I find American breezy cheerfulness depressing. And, to be honest, I found Rogers frightening and unsympathetic and was unable to watch the session with him..